My problem with this is that it doesn’t make any sense, in two ways. Firstly, why should this produce the inverse function at all? Why do you switch x and y? Why do you make y the subject? Why can you just declare “f-1=” at the end? I have seen any number of students in my drop-in centre who can do this, but have no idea what is going on or indeed what an inverse even is. Others know there is a procedure but struggle to remember what step comes next. Secondly, the written working that goes with this procedure contains things that make no sense mathematically. In this example, you write down y=3x+2 and then x=3y+2. I’d be wondering how it follows that if y is 3x+2 then you know also that x=3y+2. Indeed if both of these are true, then wouldn’t that mean you could sub one into the other to get that y = 3(3y+2) + 2? Which would mean that y = 9y + 8, and so y=-1. But wait, where did the function go? At the end, the “f-1(x)=” appears by magic. It seems to be replacing the y, but wasn’t y = 3x+2 at the start? This isn’t good maths writing! I use a different procedure. It has one or two extra lines, but it makes more sense mathematically (to me anyway). Moreover, it just uses one fundamental maths problem-solving strategy, rather than being a procedure per se. Firstly, my working includes the mathematical reasoning: the phrases with “let”, “then”, “but” and “so”. To me, this helps to make it more like proper maths writing. Also, I think it has a better chance of interpreted as reasoning rather than symbol-shuffling. Secondly, the key strategy here is to give the inverse function a name “y” so that you can more easily reason about it in the hope to find out more explicitly what it is. This is a common maths problem-solving strategy and I think it is worth reinforcing much more than the inverse function procedure because it can be used elsewhere too! 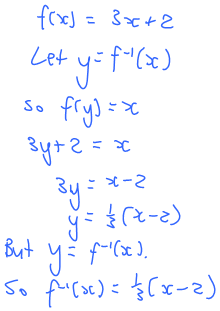 In order to do the reasoning, I have used the fundamental property of what the inverse function actually does, rather than just “switch x and y”. Give the function f-1(x) a name, like “y”. 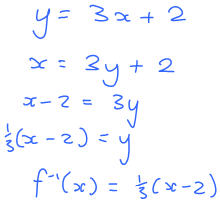 Do reasoning to figure out y in terms of x. You already know y=f-1(x), so you have the expression you need. This entry was posted in How people learn (or don't), Thoughts about maths thinking and tagged algebra, maths writing. Bookmark the permalink. That’s very slick! Of course if it was a more complicated function, then I’d probably still use y to help me maintain my focus.